UPDATE: On Monday, the Indiana House passed SB 552, the gaming bill that would move one of Gary’s casinos to I-80/94. The vote was 78-15. SB 552 now moves back to the Senate to approve or deny the changes made in the House. One change made in the House would require the Majestic Star Casino to pay $50 million to move its licenses from Buffington Harbor to I-80/94. If the author dissents to the changes, the bill will go to a conference committee where members of both chambers will work on a compromise to the bill. The Indiana House will vote Monday on the latest revisions to Senate Bill 552, the gambling bill that includes the movement of Gary’s two riverboat casinos to land. April 15 is the last day for the House to act on Senate bills. This week saw amendments on Tuesday from Ways and Means, the final House committee to take action on the bill, reduce the $100 million fee by half inserted by the House Public Policy Committee two weeks ago. The public policy committee had asked Spectacle Entertainment, the new owners of Gary’s Majestic Star Casinos to pay a $100 million fee to move one of the boats to a land location in Gary along I-80/94. SB 552 passed the senate allowing Spectacle to move both of Majestic’s two riverboat casinos to land. 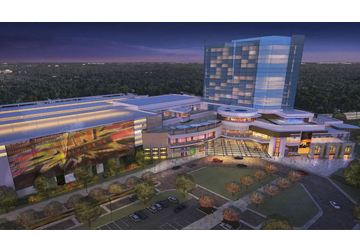 One of the two casinos would move to a more attractive location on the expressway. The other license would go to Terre Haute in Vigo County, home of Spectacle Entertainment’s owners. The Public Policy Committee also asked that the second license be sold to the highest bidder. Ways and Means let that amendment stay. The senate bill’s sports wagering provision using mobile devices was also stripped from the bill in public policy. On Thursday, the full House took actions on the bill. Thirty amendments were proposed and 6 were approved. Responding to newspaper reports that Gov. Eric Holcomb had twice accepted travel to Republican Governors Association meetings in 2018 with Spectacle owner Ron Ratcliff on his private jet, the House passed legislation limiting gambling officials access to Indiana governors. Gov. Holcomb flew with Ratcliff in November, the IndyStar reported, just before Spectacle announced its Majestic Star merger. The House voted 61-28 on Thursday to an amendment proposed by Rep. Pat Bauer to require the governor's office or a representative of the governor to post 48 hours' notice before having meetings with gambling industry officials. The provision also specifies that those meetings would have to be open to the public. The House approved Representative Matt Lehman’s amendment, tacking on another $50 million fee requiring Spectacle to hold onto the Gary license for 5 years before selling it. Rep. Earl Harris’ amendment was approved, requiring Spectacle to offer jobs at the new location to Majestic Star Casinos employees. His amendment also required Spectacle to hire casino employees at the East Chicago casino who are laid off. A House-Senate committee likely will negotiate a final version before the legislative session ends later this month.